Grilled Cheese for a cold miserable day like today PLEASE!! My son has autism – Now What?? 5 “Stupid” Myths about Organic Dairy Farming!! I want to address 5 myths about Organic Dairy Farming and why I believe you are stupid if you believe and REPEAT any of them as truths. 1. A cow or calf gets sick – you just let her die. Are you serious?? All my cows have names and personalities and are very important to me. I look forward to playing with the calves when I am feeding them and I am sad when they grow up and leave my barn . I have a conscience. I have feelings. I have a heart. Prevention is the best way to prevent my cows and calves from getting sick. I do everything possible to prevent them from getting sick. This includes vaccinations, clean bedding, and good calving environment. BUT, if one of my babies does gets sick and it is necessary to treat her with conventional medicine, I do it. It is a tough choice to make but I do it because it is the right thing to do. Unfortunately I must remove her from our operation and this is the last thing I want to do. So bottom line – I DO NOT HAVE COWS OR CALVES LAYING AROUND MY FARM DYING BECAUSE I WILL NOT TREAT THEM. 2. Organic milk is more nutritious than Conventional milk. While I wish this was true, there is no scientific evidence concluding organic milk is safer or healthier than conventional milk. The only reason I wish it were true is because it would increase the demand and increase organic milk sales. But to date there is no evidence supporting this claim. Organic Milk is a choice. A choice similar to Hemp bedding sheets versus Cotton Bedding sheets or Organic Cheerios versus Regular Cheerios. Just a another consumer choice. 3. I am an Organic Dairy Farmer because I am a “Hippie” type gal and this is how I live my life. WRONG!!! The 2 reasons we transitioned to Organic Dairy Farming. 1- We have the ideal climate, topography, and farm to successfully pasture milk cows. 2 – It is easier to “ride out” the volatile conventional milk prices received at the farm. I love Starbucks, Kate Spade purses, all things Disney, and drive a SUV. YIKES!! Not the “HIPPIE” lifestyle at all!! We want to stay in Western Washington and run our 4th generation farm. This is possible because we are organic. 4. Our cows must be lower quality, lower producing, and overall inferior animal compared to the conventional cow. NO WAY!! I am happy to share my kids are super involved in several dairy shows in Washington State and I am happy to report our animals are competitive. It is all about cow care. 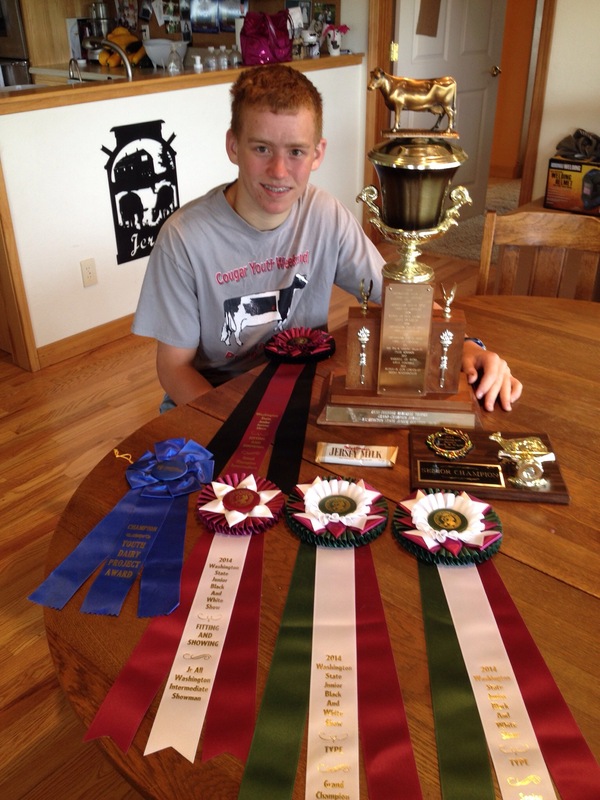 My son has won multiple fairs with Grand Champion Holstein, Grand Champion Jersey, and my daughter has done very well with her 2 Brown Swiss and holstein. We work very hard to prepare these animals and the awards prove we have animals that can compete!! 5. We completely embrace the “Organic” life. We live in Washington. Pot is Legal!! However, that does not mean that we have decided to embrace this questionable lifestyle. I guess if we could figure out how to grow and sell Organic Pot we may think about it. But as I read more and more stories about Pot growers in our state getting robbed because they can not deposit any of the money they earn from their business, I figure the risk is just not worth it. For me and my family, we will stay with milking cows. Someone else can capitalize on the organic pot market. I hope I have cleared up a few myths about Organic Dairy Farming. It really is not that complicated and I love what we do.